MJC has a student technology help desk. 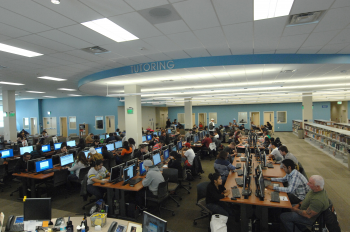 The Library & Learning Centers have hundreds of computers for you to use for your academic work. These are fully-functioning computing workstations. All MJC Library computers offer full Internet access. We also have friendly and knowledgeable technology-savvy staff who can help you with computer problems or questions. If you see a choice of terminate or connect after entering the password, select connect, then enter the name and password again. Repeat as needed. For additional help, check out the Campus wi-fI page.